Oh how I have missed libraries! Eight years living in Cyprus without one. I return to the UK in June, and … bliss. Oh I remember the old library. I went to Birmingham University! Something about new buildings housing old books that’s a bit sad. I feel like that in the British Library – I wish it was old! 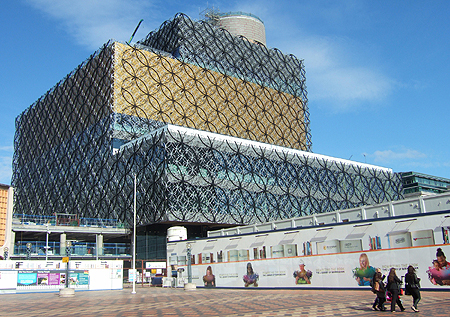 The old library was wonderfully ugly; Prince Charles once likened it to an upturned ziggurat! Even so, I’ll be really sad to see it go. It had a tremendous *presence* in the city centre and was a sanctuary to me when I first moved to the city. Mmm, book smell. Old books in new libraries is a bit sad, but the problems in keeping the very old ones supple and unfoxed is so much easier with shelves that don’t give off noxious gases and easily controlled temps/humidity/lux levels. But the buildings do lack in atmosphere. There’s nothing cosy abut glass, steel and plastic. Not the worst looking building I’ve seen, though granted not the best. I’ve given books to libraries in the past, but seldom have used them myself except for research purely for the simple reason I’m way behind on my own mountain of books to read. They were an important part of my childhood and teenage years though, and I hope future generations get the chance to enjoy and entertain such wonderful memories. I love libraries. Can’t resist dropping into them even if I have no intention/capacity to take out a book. I have to admit I don’t use libraries as often as I used to… or as often as I should. Then again, these days the fiction section seems to be full of nothing but Barbara Cartland, with hardly any of the new and exciting books that hit the streets every year. Maybe the budget cuts are having an effect.